One of the most profitable companies in the U.S. airline industry trades at a shockingly low valuation of just seven times earnings. Hawaiian Holdings (NASDAQ:HA) is on track to grow its earnings per share in 2017, unlike many of its airline industry peers and despite having already boosted adjusted EPS by 68% last year. The company's earnings power has been supported by its industry-leading unit revenue performance. 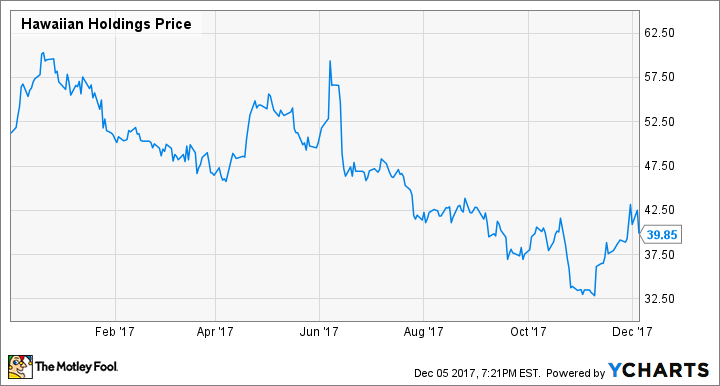 Nevertheless, Hawaiian Holdings stock has lost about a third of its value since peaking in late 2016. On Tuesday, the stock dipped back below $40 following the company's investor day presentation. It now trades for just seven times earnings. Hawaiian Airlines Stock Performance. Data by YCharts. Hawaiian's pitiful valuation can be traced to worries about its ability to fend off competition from the likes of United Continental (NASDAQ:UAL) and Southwest Airlines. Yet these fears are misplaced -- which makes Hawaiian Holdings a great stock for contrarian investors to buy now. Back in June, United Continental announced plans to ramp up its Hawaii flying in late 2017. Hawaiian Airlines' management has acknowledged that the carrier now faces pricing pressure in some of its West Coast-Hawaii markets. However, other airlines will be much worse off if fares continue to move lower. In every single West Coast-Hawaii market in which it competes, Hawaiian Airlines enjoys a unit revenue advantage of at least 7%. The carrier's average unit revenue premium on West Coast-Hawaii routes has reached 11%. This revenue premium will likely grow in the next year or so. In early 2018, Hawaiian Airlines will complete a retrofit program for its A330 fleet, dramatically increasing the availability of its new lie-flat first class seats and its "Extra Comfort" premium economy seats on domestic routes. Meanwhile, Hawaiian is about to start replacing its fleet of Boeing 767s with A321neos, which will help it better match capacity with demand in smaller markets while further boosting Extra Comfort seat inventory. Hawaiian Airlines' new A321neo fleet will help it boost unit revenue. Image source: Hawaiian Airlines. As a result, if West Coast-Hawaii growth by United and Southwest -- and Hawaiian, for that matter -- leads to overcapacity, carriers with lower revenue production in the Hawaii market will need to retrench. This will blunt the impact of industry capacity growth on Hawaiian Airlines. While Hawaiian Airlines does face some legitimate short-term headwinds in the West Coast-Hawaii market, the competitive environment within Hawaii just became much more benign. For most of 2017, Hawaiian had to deal with rapid growth by its main interisland competitor: Island Air. As a result, the carrier reported a series of worsening unit revenue declines in that part of its business. However, Island Air shut down for good in mid-November, solidifying Hawaiian Airlines' dominance of its home market. Despite Hawaiian's rapid growth over the past seven years, interisland flights still account for about a quarter of its revenue. The company is likely to post strong unit revenue growth in this market next year as it capitalizes on Island Air's disappearance. Hawaiian Holdings' biggest challenge in recent years has been cost creep. The A330 retrofit program has driven up unit costs, because it entails reducing the seating capacity of each A330 by 5.4%. Additionally, Hawaiian dramatically raised its pilots' wages this year. In total, the company expects adjusted non-fuel unit costs to increase 6%-7% in 2017. That unit cost growth will slow in 2018. Hawaiian currently expects an increase in the "low- to mid-single digits". That outlook still includes a significant drag from the A330 retrofit program. Investments such as a recently opened new maintenance hangar and cargo facility and fleet transition costs are also impacting Hawaiian Airlines' 2018 unit costs. In 2019, non-fuel unit cost growth will slow even further, perhaps even to zero. Most of the major cost headwinds that Hawaiian faces today will roll off by early 2019. The retirement of the aging 767 fleet in late 2018 will also help reduce unit costs. Last month, I named Hawaiian Holdings one of the best airline stocks to buy. Since then, the outlook has gotten even better. Hawaiian Holdings' profit outlook is improving. Image source: Hawaiian Airlines. First, the House and Senate have both passed similar tax reform bills in the past month. If they can successfully negotiate a compromise bill that passes in both chambers, Hawaiian's tax bill will decline dramatically. This could boost EPS by 25% or more overnight. Second, Hawaiian Airlines raised the midpoint of its Q4 unit revenue guidance by 2 percentage points on Tuesday. It now expects a solid 1.5%-3.5% increase, despite facing a very tough year-over-year comparison. This shows that any fare pressure on West Coast-Hawaii routes is being more than offset by strength in the interisland, international, and cargo markets. In short, investors are seriously underestimating Hawaiian Holdings' short-term and long-term earnings prospects. That makes this airline stock a compelling opportunity right now.